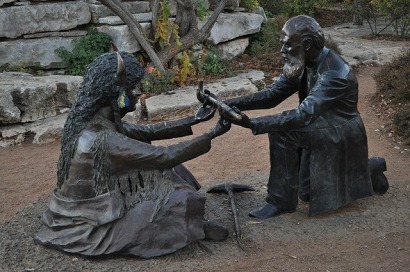 In early spring of 1847, a remarkable treaty between German settlers and Native Americans was negotiated on the banks of the San Saba River in the hill country north of Fredericksburg, Texas. The unlikely parties to the long-standing agreement, that was to eventually open up nearly four million acres for settlement, were a former German baron and the representatives of the fierce Penateka Comanche tribe. Seeking to solve the problems of political unrest and overpopulation facing mid-nineteenth century Germany by advocating immigration to the Republic of Texas, an organization of German noblemen known as the Society for the Protection of German Immigrants purchased a large tract of land in Texas. The land in question was part of the Fisher-Miller Land Grant that stretched between the Llano and San Saba rivers. Unfortunately, the Society purchased the land with little knowledge of the Texas frontier and fell victim to a disreputable businessman, Henry Francis Fisher. Fisher knew well that the land in question was inhabited by far too many war-like Comanches to be suitable for settlement. Enduring much hardship on their journey from the Gulf Coast, 439 German immigrants eventually made their way to central Texas. However, the Society�s first attempt to populate the Fisher-Miller Land Grant stalled at the settlement of New Braunfels due in part to the financial mismanagement of Prince Carl of Solms-Braunfels, the first commissioner general of the enterprise, and the refusal of surveyors to enter a land grant infested by the much feared Penateka Comanches. To make matters worse, 4000 new immigrants were on the way to the new colony from Germany. The burden of untangling this web of deceit and mismanagement fell on Prince Carl�s successor, Baron Otfried Hans von Meusebach. 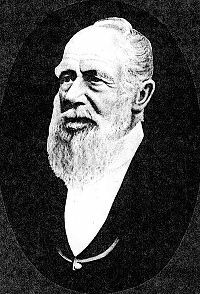 Upon his arrival in Galveston in May 1845, Meusebach put aside his title of German nobility, adopted the name John O. Meusebach, and rode to New Braunfels. There Meusebach learned that in addition to the Society�s wretched financial condition, and the Comanche problem, according to the original contract with the Republic of Texas, the Fisher-Miller Land Grant was subject to forfeit if the land was not settled by August 1847. 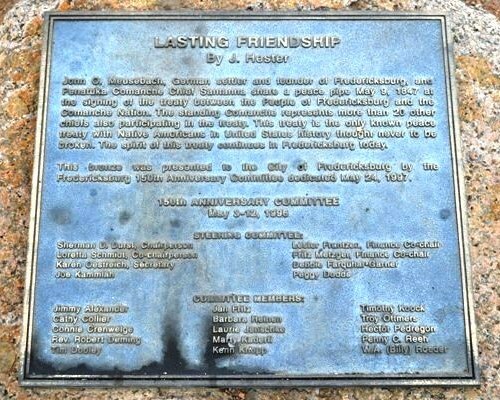 In May 1846, Meusebach moved closer to satisfying the Society�s obligation to settle the land grant by founding the community of Fredericksburg. However, in November the former baron received word of the 4000 new immigrants who were on their way from Germany. There was only one possible solution to the problem of settling so many people. Somehow Meusebach had to accomplish the seemingly impossible by reaching an agreement with the Comanches to open the vast tract of land to settlement that lay between the Llano and San Saba rivers. On January 22, 1847, Meusebach rode out of Fredericksburg with a company of forty men and three wagons and headed for the heart of the Comancheria. Included in the company was interpreter Lorenzo de Rojas who had been kidnapped by the Comanches as a child. The expedition�s ultimate goal was to secure a treaty of peace with the Comanches. Soon after the expedition�s departure, Indian agent Robert S. Neighbors arrived in Fredericksburg with a message from Texas Governor Pinckney Henderson, urging Meusebach not to venture into Comanche territory for fear that the act would further arouse the already hostile Indians. Accompanied by Dr. Ferdinand von Roemer, who had been sent to Texas by the Berlin Academy of Sciences to evaluate the mineral assets of the land grant, Neighbors set off in pursuit of Meusebach�s party. On February 5, Meusebach�s expedition was met by a party of Comanches carrying a white flag, and after mutual assurances of their peaceful intent, the parties shared a meal. The following day the Comanches led Meusebach and his men to their main camp on the San Saba. The entire camp rode out to greet the German settlers, everyone mounted including the women and children. At the urging of his interpreter, de Rojas, Meusebach ordered all forty of his men to raise their rifles and discharge them into the air, thereby disarming themselves as the huge party of Comanches neared. Some of the men thought the act foolhardy, but it served to build the Comanches� trust, and in light of the overwhelming numbers of warriors present, was most likely the only rational course of action to follow. Neighbors and Roemer arrived at the San Saba campsite on February 10, while Meusebach was waiting for the remainder of the Comanche chiefs to assemble for the peace council. In his carefully written accounts, Roemer noted Meusebach�s courage in walking among the Comanches unarmed, a habit that earned the German the respect of the Indians. They even honored him with the name El Sol Colorado or the Red Sun, in part because of his flowing red beard. Among the more prominent Comanche leaders who gathered at the assembly were the political chief Old Owl, short and frail in stature, the tall muscular war chief, Santa Anna, and the dour Buffalo Hump, famed warrior and leader of the Great Comanche Raid of 1840. During the negotiations which began on March 1, and ended on the following day, Meusebach�s lack of prejudice toward the Indians, a view seldom shared by most whites, was reflected in his opening words to the assembled chiefs. �I do not disdain my red brethren because their skin is darker, and I do not think more of the white people because their complexion is lighter.� Meusebach also stressed that his people were neither Texan nor Mexican, two peoples the Comanches hated the most. Even more important than his words, however, were the terms of peace offered by the former German baron. Unlike most Indian treaties which were usually no more than articles of surrender, heavily weighted in behalf of the whites, the treaty offered by Meusebach provided for an equal balance of recognition and dignity as between good friends and allies. First, the Comanches agreed to share their hunting grounds with los Alemanes and grant the German settlers and the Society�s surveyors free access to the land between the Llano and the San Saba Rivers in exchange for $3000 in presents and supplies. The Germans also granted the Comanches free access to their settlements to �go wherever they please,� and finally, both sides agreed there would be mutual reports of any wrong doing. The Meusebach-Comanche Treaty opened up a vast stretch of land for settlement that would one day become all or part of ten Texas counties; a total of nearly four million acres. Other than the presence of Indian Agent Robert Neighbors at the negotiations, the United States played no part in the treaty except to later recognize it. The agreement reached on the banks of the San Saba River remains the sole treaty negotiated between a Plains Tribe and settlers as private parties, and is believed to be the only pact between whites and Native Americans that was never broken. The Meusebach-Comanche treaty was truly an achievement of note by John O. Meusebach, a man of determination, courage, and vision. The Story of our Texas' German Pilgrims: or Death March to Comal County by W.T. Block, Jr. Some Notes on Our Texas Germanic Heritage by W.T. Block, Jr.
References for "The Meusebach-Comanche Treaty"
Davis, Joe Tom (1982), Legendary Texans, Eakin Press, Austin, TX, ISBN 0-89015-336-1. Fehrenbach, T.R. (1968), Lone Star: A History of Texas and the Texans, Macmillan Publishing Company, New York, NY, ISBN 0-02-032-170-8. Jefferson, Morgenthaler (2007), The German Settlement of the Texas Hill Country, Mockingbird Books, ISBN 978-1-932801-09-5. King, Irene Marschall (1987), John O. Meusebach, University of Texas Press, Austin, TX, ISBN 978-0292740198. Smith, Cornelia Marschall; Tetzlaff, Otto W. "Meusebach, John O." Handbook of Texas Online (http://www.tshaonline.org/handbook/online/articles/fme33), accessed May 3, 2012, Published by the Texas State Historical Association.